I attempt to maintain my body weight by following Weight Watchers and counting points daily. This past Sunday I made chili and lemon bars, both Weight Watchers approved. It’s a good thing too because when the Packers are losing or ultimately lose, I overeat. Unfortunately, in our present season, there’s no magic pill to control body weight, ask NFL pass rushers. 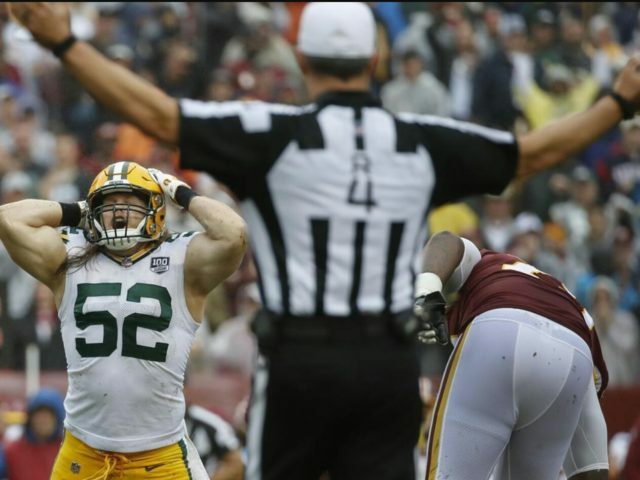 According to ESPN Stats and Info Clay Matthews, from 2009 – 2017 was called four times for roughing the passer. This season Matthews has already been flagged three times. Watching your body weight is hard and isn’t fun………especially when your peers are out eating pizza, drinking beers, and suplexing everyone without consequence, yah feel me? I guess that’s the way the cookie crumbles any given Sunday. There’s not an NFL team that’s been hurt more by the body weight rule than the Green Bay Packers. Personally, it hasn’t been kind to my waistline or blood pressure. NFL competition committee, we’re counting on you to be the voice for a cure. Let’s keep the suplexing flags in the parking lot only this Sunday when the Bills Mafia comes to town. I have a 6-foot banquet table that is old, heavy, and broken underneath, which, against my husband’s better judgment will make its way into the truck, and ultimately to the tailgate. I’m going to put a ‘free to a good home’ sign on it. Noon games are my favorite. Bloody mary weather is upon us, and I have a fabulous recipe for Old Bay seasoning/Cajun flavored pretzels that will be the perfect match. Victory Oreos are lined up for the ride home because I have no doubt that the Packers will take care of business at home. A 13x World Champion vibe always, we welcome back Aaron Jones who averaged seven yards per carry versus Washington. Also, Packer family who made it to FedExField, we heard you, outstanding! This entry was posted in Packers 2018-2019 Season, Packers History, Sarah Szejn and tagged Aaron Jones, Bills Mafia, bloody mary, body weight rule, FedExField, Green Bay Packers, NFL competition committee, Old Bay, Oreos, suplex, tailgate, Weight Watchers. Bookmark the permalink. i enjoyed the fresh perspective. Watch Tramaine Edmunds this Sunday when we play the Bills. He’s just another first round draft pick the Packers passed on in order to draft and undersized corner. He’ll also be in the running for defensive ROY. We must draft better to get better.